Your time and talents can truly make a difference. The rewards are rich as you help future generations learn and grow. In addition to working with young people, we offer volunteer opportunities as interns, hosts at our events, and assistants in the Joseph L. Brechner Research Center. 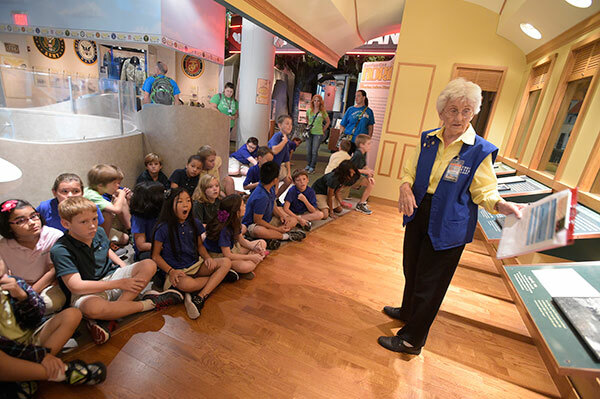 Docent training involves weekly sessions and is organized into two parts. Training Part 1 goes in-depth with exhibit content, museum teaching techniques, and best practices. Training Part 2 enables volunteers to co-teach alongside staff and peer docents. After a maximum of 10 weeks, volunteers will begin touring with groups on their own. Orientation – Check Out a Tour! • April 1-12: any one day, 10:30 a.m. – 12:30 p.m.
*All four training dates are required before moving on to the next phase of training.